Oogy Wawa! (and if you don't know what that means, read on). Here's news of a special event passed along to me by my friends at Heavy Seas Brewing, and it concerns a special friend of many in the Baltimore, Maryland, beer world. 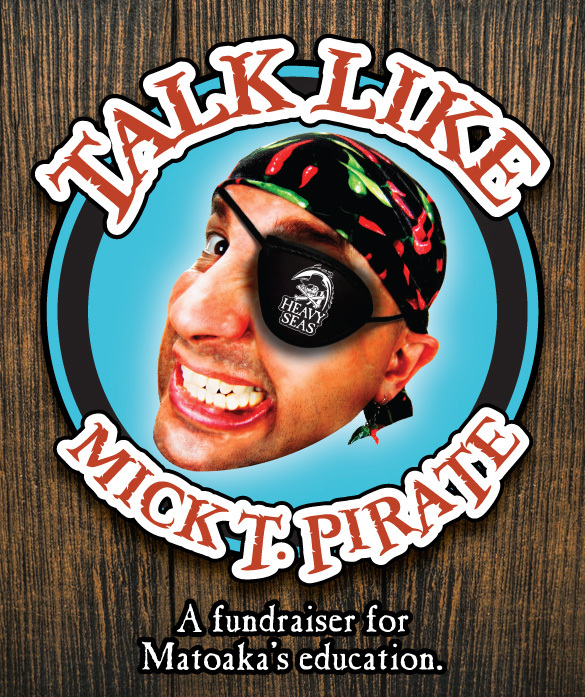 UPDATE: Originally we had planned a singular event on September 19th, International Talk Like a Pirate Day, to raise money for an education fund for Mick's daughter, Matoaka. As with any nautical excursion, sometimes there is a change of course. We have decided not to do a special event on September 19th, but rather to celebrate his life by donating 10% of the net proceeds from our Beer & Bacon Fest and our next 3 festivals to Matoaka's education fund. September is Vegan MoFo 2013. Via YFGF. Evidence uncovered of Stone Age food preparation using spices for flavor enhancement: Pottery shards that date back to about 6,000 years ago contain microscopic fossils of crushed mustard seeds. Via University of York, at NPR. A complete radical shift away from grain-fed animals and biofuel would increase calorie availability enough for 4 billion people simply with food grown on existing farmland. Via Institute on the Environment at the University of Minnesota, at NBC News. Reviving Eight Row Flint: an heirloom corn that packs more flavor and nutrition, and why it nearly disappeared. Via NPR's The Salt. The fourth annual Cheesemonger Invitational: 27 July 2013, Long Island, New York. Via The New Yorker. The winners of the Washington Post's annual tomato recipe contest. Not all are vegetarian. Sweet-Tart barbecue sauce. Via Splendid Table. Eggplant 'Meatballs' in Tomato Sauce. Recipe via Domenica Marchetti from her new cookbook: The Glorious Vegetables of Italy (Chronicle). From a post by Joe Yonan via Washington Post. How to cook dry beans: in a pressure cooker, in a slow cooker, and on the stove-top. Via Happy Herbivore. Vegan food bloggers: today, it's a special Tuesday edition of VeggieDag Thursday, because tomorrow, 28 August, will be your final opportunity to register your blog as a participating member of the Vegan Month of Food. That's Vegan MoFo. It’s time for VeganMoFo, the Vegan Month Of Food, beginning September 1, 2013 this year! VeganMoFo was originally created on the Post Punk Kitchen [by cookbook author Isa Chandra Moskowitz], as an homage to NaNoWriMo [National Novel Writing Month]. Because we do want to write novels, but sometimes cooking gets in the way. So why not combine them! There aren’t strict guidelines for how often to write, but the idea is to shoot for every weekday, or about 20 times in the month. If you’d like inspiration or would just like to whine about how hard it is, check out the MoFo forum on the Post Punk Kitchen message boards. We’re also on Facebook and Twitter! Absolutely not! Anyone who wants to blog about vegan food for a month is welcome to do so. However, during MoFo we ask that participants keep their blog strictly vegan including all images. Yes, even if it’s not straight-up milk/eggs/meat. Also, yes, this means honey. My partner/children/friends aren’t vegan, am I allowed to mention this? We aren’t going to vegan police your blog if you mention your husband eats tuna, but please don’t post pictures of said tuna. We had a few instances of people doing this in past years, and it was disturbing for people who were perusing what is supposed to be a 100% vegan blogging event. Do I have to post every day in order to not be kicked off the blog roll? No! However, participants should aim for 20 posts during the month of VeganMoFo. Any blogs we notice without content, or are brought to our attention due to inactivity will be automatically removed from our feed. YFGF will not be enrolling in the Vegan MoFo blogroll. Why? Well, despite twenty-two years of living a meat-fish-fowl-free life and despite the occasional VeggieDag Thursday column, I write this blog about beer (and other good fermentables). Of course, as beer is, at its core, a fine, best-fresh, non-animal-based, fermented-grain liquid food, one might consider each YFGF post a post about vegan food. But, at the very least, I'll be faithfully following along, contributing a vegan food story each and every Thursday in September. Help publish Lucy Saunder's "Dinner in the Beer Garden." Sign up and write. View and post photos to Instagram: here. View and post photos to Flickr: here. Follow on Facebook and Twitter. Or just follow, and eat, along. Beginning Sunday, 1 September, it's Vegan MoFo 2013. 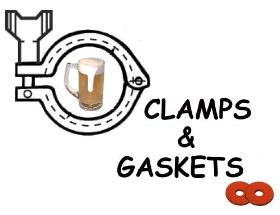 Clamps & Gaskets: News Roundup for Weeks 31/32, 2013. Why true "Lambic“ beer is only made in Belgium. (And the Twitter brouhaha about that.) Via Beervana. Amazon's Jeff Bezos buys Washington Post for $250 million dollars. Via Huffington Post. In Lithuania, so-called 'craft' beers are considered trendy vs. the 'traditional' beers made by small brewers with classic ingredients. Via Joe Sixpack. Happy birthday, Louis Armstrong! Born today in New Orleans in 1901. Via Wikpedia. You've got mail! U.S. Postal Service considering delivering beer, wine, and spirits. Via AP. Washington, DC area brewpub Bardo returns, at least temporarily, without Bardo beer. Via Washington Post. It's Virginia Craft Beer Month, as state breweries, restaurants, and shops celebrate the state's nearly 60 craft breweries. Via CBS News. It's International #IPADay! What's in your glass? Via #IPADay. American craft beer sales up during first half of 2013: 15% by dollars, 13% by volume. Via Brewers Association. Romantic comedy “Drinking Buddies," is filmed in an American craft brewery, starring Olivia Wilde and Jake Johnson. Via Today. A brief history of sour beer, and its ascendance in the U.S. Via New Yorker. In 2007, Garrett Oliver (r) at Dr. Dremo's (now closed) in Arlington, Virginia, with owner Andrew Stewart (l). Birthday in beer: Garrett Oliver —author and brewmaster at Brooklyn Brewery— is 51 today. Via Brookston Beer Bulletin. Sales of craft beer up in first half of 2013, but total US beer sales down 2.6 percent. Via CNBC. Saturday was the second annual running of the Virginia Craft Brewers Fest, held on the grounds of the Devils Backbone Brewpub, in Roseland (Nelson County), Virginia, presented by the Virginia Craft Brewers Guild. Virginia 'craft' beer business is booming. According to the AP, production in Virginia grew nearly 37 percent in 2012, to more than 84,000 barrels (more than double the national growth rate of 15 percent). There are more than fifty breweries 1 currently operating in the state; thirty-three breweries participated in the Fest. And more than 2,200 Virginia-beer fans attended. As part of the day's festivities, twenty judges assessed 131 Virginia-brewery beers, in fourteen different categories, awarding gold (1st place), silver (2nd place), and bronze (3rd place) medals. Of those, they selected three overall Best of Show winners, awarding the 2013 Virginia Craft Brewers Cup. For the second year in row, Devils Backbone reigned victorious. In addition to its Virginia Craft Beer Cup win, host Devils Backbone took the most golds, four (and the most overall, eight). Blue Mountain took two golds (and six medals overall). Wolf Hills took two golds (and three medals overall). Fifteen more breweries were awarded two medals apiece. The northern Virginia area 2 is this blog's home territory. 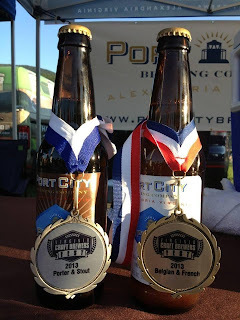 Of the seven northern Virginia breweries entered —22% of the thirty-three Virginia breweries participating— one accrued one gold medal (Port City, for its Optimal Wit) and all garnered a total of seven medals: 15% of the total awarded. Beer Judge Certification Program (BJCP) 'master' judge Tom Cannon did a good job whittling down the unwieldy 75 categories of the Great American Beer Festival (which are further divided into sub-categories) into a more reasonable and meaningful set of 14 categories 3 for the Virginia Craft Beer Fest. Congratulations to Devils Backbone (and to River Company and Hardywood), the best of Virginia ...at least until next year! And, congratulations to all the winning breweries and brewers: thank you for brewing us good Virginia beer. She just might be the best dressed brewer in the Washington, D.C. area. Or, at least she was at Cask Night. She is brewster Kristi Mathews Griner, whose official title is Director of Brewing Operations for the Capitol City Brewing Company, of Shirlington, Virginia. With her in the photo is her assistant brewer, Matt Ryan. Cask Night was a pre-DC Beer Week event, held at the District Chophouse & Brewery, celebrating local cask-conditioned ales. Griner and Ryan brought The Gilded One, a cask-conditioned American-style IPA (India Pale Ale), single hopped with El Dorado. George F. Will gets it wrong, but, in 2008, he got it right, and then, wrong again. In a recent op-ed about the state of Michigan's takeover of the bankrupt city of Detroit, columnist George F. Will managed to mangle the facts. In "The one who would reinvent Detroit" (7 August 2013. Washington Post), Will wrote about Governor Rick Snyder and his plans for the city. Against this litany of woes, Snyder happily illustrates the city’s revival by brandishing his shiny new wristwatch. It is a Shinola, manufactured here from Swiss parts, by a startup that also makes bicycles and other things. About the vacant land opened up as the population has contracted Snyder says: “Hops.” This grain [emphasis mine] is used to make beer, and microbreweries make, or at least often accompany, urban gentrification. Correct on a connection between 'craft' breweries and urban renewal, Mr. Will is wrong on basic agronomy. Hops (humulus lupulus) —despite many beer geeks' obsession with them— are not the grain that is used to make beer. They aren't grains at all. Hops are herbs, which, for hundreds of years, have been used as the primary flavoring, preservative, and bittering agents in beer. It is barley (hordeum vulgare) which is the principal cereal grain used to brew beer. It is closer to the truth to say: No beer, no civilization. Then, in his summary, Mr. Will relapses. Although Mr. Will and many of us may share that sentiment, Franklin never actually wrote those words. What he did write was a prolix encomium ... to wine. Ah, the inconvenience of facts. Served from a wooden barrel, Gordon-Biersch Solidarity Ale was one of 22 cask beers, brewed by Washington, D.C.-area breweries, presented at Cask Night, a festival of cask ale held at brewpub District Chophouse, 9 August 2013. Well, the beer wasn't exactly from the wood. And, it wasn't exactly cask-conditioned. What was it then, besides delicious? First, some background. In July 2013, several Washington, D.C.-area brewers gathered at brewery DC Brau to collaboratively brew a "Solidarity Ale," in style, an English Summer Ale, to be released during the festivities of DC Beer Week 2013. Light straw to golden colored with medium-low to medium bitterness, light to medium-light body, and low to medium residual malt sweetness. Torrefied [sic] and/or malted wheat are often used in quantities of 25% or less. Malt flavor may be biscuit-like. English, American or Noble-type hop character, flavor and aroma are evident, and may or may not be assertive and always well balanced with malt character. [Unclear. Is it balanced or unbalanced?] Mild carbonation traditionally characterizes draft-cask versions. In bottled versions, normal or lively carbon dioxide content is appropriate. The overall impression is refreshing and thirst quenching. Fruity-ester characters are acceptable at low to moderate levels. No butterscotch-like diacetyl or sweet corn-like dimethylsulfide (DMS) should be apparent in aroma or flavor. Chill haze is allowable at cold temperatures. DC Brau's official Solidarity Ale debuted at Cask Night, cask-conditioned. The cask was 'dry-hopped' with Zythos and Ahtanum, and primed with brown sugar. 4.7% abv. 25 IBUs. Several of the collaborating brewers would brew their own versions of Solidarity Ale as well. Scott Lassiter —brewer at the Washington, D.C., downtown location, of national brewpub chain Gordon-Biersch— was one. He brewed his iteration from a simple grist of imported English Maris Otter malt —imparting a graham-cracker maltiness and ruddy hue— and from English Fuggles hops —imparting an earthy spiciness. A simple ingredient list, but not a simple beer: elegant, bright, well-carbonated, with a hint of yeasty, estery fruit (pear), and finishing dry. 5.1% abv and 30 IBUs. a natural product brewed using traditional ingredients and left to mature in the cask (container) from which it is served [without extraneous gas pressure] through a process called secondary fermentation. It is this process which makes real ale unique amongst beers, and develops the wonderful tastes and aromas which processed beers can never provide. 'Real ale' is fresh, unfiltered, and unpasteurized; the yeast in the cask is still active. The level of carbonation is less gassy than that of draft or bottled beer. The ale is served at what is called 'cellar' temperature, in the low to mid 50 degrees Fahrenheit (never at room temperature! ): the beer's flavors, especially those of lower-alcohol cask ales, are more evident at this temperature. Lassiter's brewery is lager-centric. His regular practice, as primary fermentation nears completion, is to close the pressure-release valves of his fermenters. The final carbon dioxide produced by the yeast is trapped in the fermenters and absorbed into the beer. This is a traditional German method called 'gespundet,' meaning bunged or capped, and results in natural, full carbonation. Lassiter did the same with his Solidarity Ale, but then racked (transferred) a small amount of the unfiltered, finished beer into the vessel pictured above. It's not a wooden barrel but a stainless steel cask, decoratively wrapped by wood. So, was Gordon-Biersch's Solidarity Ale a 'real ale,' as defined by CAMRA? No, technically, it was not. It was tank-conditioned and it was transferred into a serving cask. But, was it delicious, with no added frou-frou ingredients, but with that sense of uber-freshness common to cask-conditioned ales, and with a decidedly British-ale flavor? Yes, and, coming as it did from a lager brewery, it was a special ale indeed. I don't want to give the wrong impression. There were many well-made cask-conditioned ales (and a couple of lagers) at Cask Night. Here are three I'll give special mention to. Host District Chophouse's Solidarity Ale: minty and citrusy from hops Amarillo and Mosaic. 5.6% abv. Mad Fox Brewing's (Falls Church, Virginia) English Summer Ale, hopped with Citra hops: bright, orange-citrusy-zesty. 5.2% abv. A bronze-medal winner at the 2011 Great American Beer Festival. From Oliver Ales (Baltimore, Maryland): Human See, Human Do. A wheat ale, spiced with coriander and bitter orange peel, and only 3.2% alcohol-by-volume, it was a powerhouse of flavor, and quite bright for a wheat beer. In fact, it was one of the brightest (clearest) cask beers of the evening, unfiltered, demonstrating mastery of cask-conditioning technique. A touch of diacetyl (buttery flavor produced by the Ringwoood yeast) was malt-like and not unpleasant or inappropriate. Towards an American cask ale-style? There seem to be four major trends gaining traction in American cask ale, and all could be seen (and tasted) at Cask Night. One is Cask anything. If it's beer, American brewers put it in a cask. Another is the flavored one-off. Many American brewers seem to be producing their cask-ales —not as an expression of the absolute freshest their beer can be— but as opportunities to toss in extraneous ingredients. When done in chef-like moderation, that's not necessarily a bad thing. But it can easily be overdone. I overheard one drinker at Cask Night describing an overly-herbed beer, as he dumped it, as tasting like shampoo. 'Un-brightness' is another. Several ales at Cask Night were so cloudy, that it seemed as if the brewers were giving the finger to the tradition of bright British-style cask ales. Finally, American cask ales tend to be very high in alcohol, or, at the very least, higher than was common to British cask-conditioned ales in the mid to late 20th century (i.e., 4% abv or less). Might these four practices —'cask it all', cloudiness, high alcohol, and flavoring— be considered as identifying hallmarks of a nascent U.S. cask ale-style? For better or for worse, that's a question worthy of further discussion. Not so long ago, I bemoaned, be-tweeting, the dearth of full-flavored beers of lower alcoholic strength from small and independent American breweries. In response, a 'craft' beer geek tweeted back: "There are so few because they don't taste good." So, so wrong. We're not talking 'lite' beer here, fella. Even the use of the term "lower alcohol" itself engenders prejudice. There is no zymurgical reason why a beer of, say, 4% alcohol-by-volume (or lower) cannot be flavorful. The British (and Germans) have been brewing such for years. Early practitioner U.S. 'craft' brewers did such. Influential U.S. beer writers, such as Lew Bryson, have written often, and powerfully, in praise of such. Although 'craft' breweries have been brewing ever stronger and stronger beers (one even reaching a prodigious, if ridiculous, level of 55% alcohol-by-volume), the tide may be turning, or, shall I say, the mash grist lessening. More and more, U.S. 'craft' breweries are re-discovering the beauty and economy of smaller beer. So-called 'session' beer is becoming hip. Reference, for example, All Day IPA, from Founders Brewing, of Michigan, recently promoted to flagship status (even though, at 4.7% alcohol-by-volume, the alcoholic goal post of 'session' beer can be a moving target). Some of the better posts at my blog have been written by others. Witness another, excerpted from a post by Jeff Alworth, at his blog, Beervana. I've reprinted it here, with his permission. Shunning the gerundival 'sessionable,' Alworth has written an economical, eloquent paen to the beauty of 'small' beer. I am a fan of small beers. However, unlike many of my fraternity, the reason isn't because I particularly care about long sessions in a pub. For me, the reason is purely aesthetic: small beers taste great [emphasis mine]. Aesthetics is something we don't often apply to beer, but we should. We should approach each beer with an eye toward a kind of artistic mark of perfection and say: how does this beer perform against an ideal? In this way, best bitters are not judged ill because they lack the roasty heft of an imperial stout. Beer geeks are generally pretty good about this, except when it comes to beers that ring in at under 5%. They are then dismissed as lesser substances, like diet soda, skim milk, or frozen yogurt. 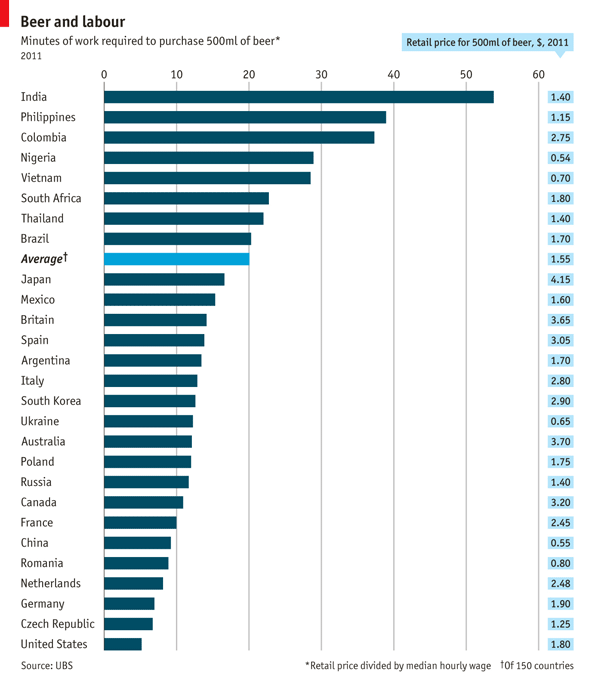 (And indeed, in America the small beer has been roughly treated--it's often a throwaway beer aimed to appeal to Bud drinkers.) Yet a small beer by its nature is not a compromise. It exists as a fully-formed beer, ready to be judged on its own merit. Many small beers are vivid with flavor. The virtue of small beers is that they have less molecular density; the flavors have room to unfurl and blossom in the mouth. Certain styles have taken full advantage of this: Bavarian weizens have remarkable complexity (and are just psychedelic, period); Irish stouts can be sharp and intense with roast and hop bitterness; Berliner Weisses are so sour that Berliners developed the practice of cutting them with sugar syrups. And on cask, British ales reveal flavors you can never find on regular taps, sometimes with such bell-like clarity you feel you've found a fourth dimension of beer. [emphasis mine] Unlike heftier beers, the flavors in these little ones are distinct, particular, and knowable . Small beer. Say it loud. Say it proud. Amen, brother Alworth, amen! In early 2011, there were exactly three brewpubs in Washington, D.C., and exactly zero production-only breweries. That changed in April of that year when DC Brau opened its doors. Since then, two more production-breweries, 3 Stars and Chocolate City, have fired up their kettles. Now, D.C. gets its 4th production brewery. Atlas Brew Works begins shipping draft beer the first week of September. Along with yesterday's good beer news, what a noteworthy DC Beer Week this has become. Here's the brewery's press release. WASHINGTON, D.C. – Atlas Brew Works, the District’s newest production craft brewery, today announced the dates its fresh, local craft beers will be available in bars and restaurants around the District of Columbia: September 2nd through 8th, 2013. Atlas Brew Works, founded by Cox and award winning professional brewer Will Durgin, will launch the week of September 2nd -8th with an event in a different neighborhood across D.C. each night. Atlas will premier three beers that week: Rowdy, a hop-forward American-style Rye ale, accented by the peppery notes of rye; District Common, a California Common featuring Czech Saaz hops; and a third beer, NSFW, which will remain a surprise. Atlas Brew Works is also excited to announce the addition of Dan Bedford to its brewing staff. Bedford’s impressive resume includes working on the brewing and cellar staff at Flying Dog, in Frederick, Maryland, followed by brewing for the Bristol Beer Factory, in Bristol, England. “Dan is a great addition to our team and the skills he brings to Atlas will be an asset to our brewery’s mission of brewing local craft beer of the highest quality.” commented Head Brewer Will Durgin. Atlas Brew Works is located in the Ivy City neighborhood of North East DC and will provide fresh, local craft beers to thirsty Washingtonians in taverns and restaurants across the District. DCBeer has posted the list of venues for the official release. One Mad Fox becomes two! Virginia brewpub to open 2nd location, in Washington, DC. Just a few months after the announcement that Baltimore, Maryland's Heavy Seas Alehouse would soon be opening its second location, in Rosslyn, Virginia, now comes the breaking news that Mad Fox Brewing Company —a three-year-old brewpub in Falls Church, Virginia— is also crossing state lines, and opening a second location: a non-brewing draught-house and restaurant in Washington, D.C. There's an important distinction to keep in mind: the Heavy Seas Alehouse is not owned by the Heavy Seas Brewing Company, even though the beers featured will be those of the brewery (similar to the arrangement at the Dominion Brewhouse and the several locations of the Dogfish Head Alehouse). The new Mad Fox Taproom, however, will be owned by principals of the Mad Fox Brewing Company, if not other investors. Coming as it does in the midst of the biggest DC Beer Week yet, this (well-kept secret!) announcement is yet another indication of, if not a coming-of-age of the good-beer culture in the greater Washington, D.C.-area, at least heady momentum toward that goal. Congratulations are due to the Mad Fox crew. 12 August 2013 – Following last month’s festive celebration of the third anniversary of its flagship brewpub in Falls Church, Virginia, Mad Fox Brewing Company announced today that it will expand to Washington, D.C., with plans to open a 4,590 square foot taproom at 2218 Wisconsin Avenue, NW, in Glover Park. Mad Fox Taproom, a 127-seat neighborhood establishment, is slated to open by the end of first quarter 2014, depending on the renovations needed and the permitting process. The Mad Fox Taproom will showcase its award-winning handcrafted beers with draught and English-style cask service, with up to 24 draught and cask options. Diners can expect a full menu with appetizers, sandwiches, burgers, salads and small plates. Opening in Washington, D.C., has been part of the business model ever since Madden and business partner Rick Garvin formulated the Mad Fox concept in 2007. Though the pair eventually settled on Falls Church as its home base, Madden has experience expanding brewing concepts in the region. He served as Executive Brewer at Capitol City Brewing Company where he helped grow from one to five locations during his 10-year tenure. Madden hopes to have the details finalized in time to take possession of the property in September. Assuming permit approvals and renovations go briskly, the Mad Fox Taproom could be open as early as the first quarter of 2014. The original Falls Church location of Mad Fox Brewing Company is situated between Tysons Corner and Arlington at 444 West Broad Street in Falls Church. Mad Fox has taken home numerous nationwide awards since opening its doors three years ago under Madden’s leadership. This year alone, Mad Fox earned two “Best of 2013” honors by readers of Northern Virginia Magazine: Brewpub and Guy’s Night Out. Not just a spot for beer connoisseurs, Mad Fox Falls Church has received critical acclaim for its cuisine as well. The brewery features a seasonal menu with many items made in house from scratch. Executive Chef Andrew Dixon prides himself on using locally-sourced produce, meats, cheeses, and other farm fresh ingredients. Clamps & Gaskets: News Roundup for Weeks 29/30, 2013. Singer/songwriter J.J. Cale dead from heart attack at 74. Via NPR. Maryland Court of Appeals rules that Maryland restaurants are not responsible for patrons’ actions after they leave. Via CBS. Union Craft Brewing —Baltimore, Maryland's first production brewery since 1978— celebrated its 1st anniversary on 27 July 2013. Via YFGF. Scientists discover what is causing the Colony Collapse Disorder (CCD) that has wiped out an estimated 10 million beehives in the U.S., and it’s a potential agricultural calamity. Via Quartz. A blogger named The Food Babe slams beer as unhealthy. Beer experts respond. Via YFGF. MillerCoors accuses Goldman Sachs, Morgan Stanley, and JPMorgan Chase of artificially driving up the cost of aluminum, and thus the cost of canning beer. Via Reuters. Virginia brewery to produce beer only for other breweries, under contract. Beltway Brewing profiled by Washington Business Journal. After nine years, Washington Nationals Major League team decides to offer local beer, but does so without refrigeration. Via YFGF. The Brewers Association of Maryland has created a Google Map of Maryland breweries, current and planned. Dennis Farina, well-known TV and film character actor, dies at 69. Via CNN. A cautionary tale. The city of Detroit is declared bankrupt, at $19 billion, the largest municipal filing in U.S. history. Via The Prospect. Summer advice: drink indoors. Mosquitos are attracted to beer drinkers. Via Smithsonian Magazine. Anheuser-Busch was sold five years ago. Lessons for today's beer business. Via YFGF. A map of Washington D.C.-area breweries and good-beer bars. Via DCBeer. DC Beer Week begins on Sunday, but Friday and Saturday, there's an unofficial DC Beer Week 'soft' opening: Cask Night & Day at the District ChopHouse & Brewery. This is the third year for this local real ale 1 showcase, which has been a hot commodity in the past, selling out. So, this year, District Chophouse brewmaster Barrett Lauer has expanded it: "We are doing it again this year, only a little bigger and longer (no snickering)." The double date offers greater opportunity to taste cask-conditioned real ales from many local breweries, and to meet the brewers themselves (often not the case at beer festivals). Unlimited sampling of casks, District ChopHouse fare, complimentary tasting glass. Friday, 9 August, from 6 pm until 11 pm. Saturday, 10 August, from 12 noon until 5 pm. Closest Metro stop is Gallery Place-Chinatown (exit at 7th & F). Tickets are $50 apiece, including tax and gratuity. To reserve, call 202.347.1922, or email chophousebanquet@aol.com. As of this morning, here's the line-up of 22 cask beers to expect. - #4 (American-style IPA). Hopped with Ahtanum and Palisade; lavender added to firkin. 5.5% abv. - Resurrection Ale (Belgian-style brown abbey ale). Dry-hopped with Northern Brewer; infused with oak chips. 7.0% abv. - The Gilded One IPA (American Style IPA). Single hopped with El Dorado. 5.8% ABV. 62 IBUs. - Solidarity Summer Ale (English Summer Ale). Dry hopped with Zythos and Ahtanum. 4.7% abv. 25 IBUs. Pre-Prohibition Style Lager 6.8% abv. - Solidarity Summer Ale (English Summer Ale). Single-hopped with Amarillo; dry -hopped with Mosaic. 5.6% abv. 25 IBUs. - Bea’s Brew. Experimental ale brewed with cocoa nibs, coffee, raisins, and Belgian yeast. Aged on oak 18 months. 7.3% abv. - Sour Bourbon Saison (Belgian-style Saison). Aged in an inoculated Bourbon barrel for 2 years. 9.1 abv. - 97 Pound Weakling (American-style wheat wine) With assertive hop character. 10.1 abv. 80 IBUs. - Solidarity Summer Ale (English Summer Ale). Single hopped with Fuggles. ABV 5.1%. IBUs 30. - Blonde Bock 25th Anniversary Lager. 7% abv. 30 IBUs. – Red Sky at Night Saison. Spiced in cask with lavender, chamomile, and jasmine. 7.5% abv. 17.5 IBUs. - Tropical Thunder (American Wheat Beer). Hoppy wheat ale collaboration with Liberty Tavern and Lyon Hall. 5.3% abv. 32 IBUs. - English Summer Ale. Lightly hopped with Citra. 5.2% abv. 28.6 IBUs. - Cocoa Brown (Scottish-Style Export). Infused with chocolate. 4.8% abv. - Crom's IPA (American Style IPA). Hopped with Chinook, Centennial, Simcoe, and Amarillo and dry-hopped with Citra. 5.9% abv. 75 IBUs. - Human See, Human Do (Wheat Ale). With coriander and bitter orange peel. 3.2% abv. - Grapefruit Duckpin Pale Ale (American Style Pale Ale). Pink grapefruit zest added to firkin. 5.5% abv. 55 IBUs. - "They Made Me Do It" Blueberry Ale (Golden Ale). With blueberries. 4.1% abv. 21 IBUs. - Daily Crisis IPA (English Style IPA). Hopped with Target, East Kent Goldings. 6.1% abv. 55 IBUs. In late July, many local brewers met at the facilities of DC Brau to collaborate on a brew for DC Beer Week. Called Solidarity Summer Ale, it's described as a "sessionable pale ale." Cask Night (and Day) will be its unofficial unveiling. It arrived with some stealth, and you might not have heard the news, but August 2013 is Virginia Craft Beer Month. Last year, there was more of a coordinated oomph to the thing, with even a proclamation from the Governor. This year, the Virginia Tourism Corporation (a government/private industry coop) seems simply to have declared it as such. Curiously, the Virginia Craft Brewers Guild has posted little to its website to promote it. Two major events bookend this year's Virginia Craft Beer Month. The first has already occurred: Virginia Beer Live! at the Richmond Coliseum, with twenty-two participating breweries. The second is the Virginia Craft Brewers Fest, to be held on Saturday, 24 August, on the grounds of the Devils Backbone brewpub, in Roseland (Nelson County). It's the second year for this celebration and competition of Virginia beer. And, for this, the Virginia Craft Brewers Guild is indeed all in. More than 40 Virginia breweries are expected to attend and pour their beers, accompanied by music, food, and all the trappings of a fun day. Later, in the early evening, certified beer judges will vote for the best Virginia beers in various categories, as well as selecting the overall best in the state, to which will go the Virginia Craft Brewers Cup. The trophy itself, fashioned from kegs, is patterned after the Dominion Cup, its predecessor from the 1990s. How many breweries are there in Virginia? In addition to Anheuser-Busch InBev, in Williamsburg, and MillerCoors, in Elkton, the number varies depending on to whom you're speaking. The Virginia Craft Brewers Guild lists 24, but those are dues-paying members only. The Mid-Atlantic Brewing News lists 43. YFGF's list of Virginia breweries 'on' Twitter shows 46 (34 active, and 12 in planning or under construction). The Virginia Tourism Corporation also counts 46. And, CBS News gives a count of 60+ (without a list). Whatever the number, this is a remarkable change from 1986, when there were only two breweries in Virginia: the ABIB plant and Chesbay, Virginia's first post-Prohibition microbrewery (located in Virginia Beach, but now long-closed). As Paul Gaza of the Brewers Association noted at the 2013 Craft Brewers Conference, "On the average, every American now lives within 10 miles of a brewery." According to the Beer Institute, the beer industry in Virginia —big and small, breweries, wholesalers, and retailers— generated 52,000 jobs in 2012, and contributed $1.3 billion in taxes: business, personal and consumption. The numbers were not broken down into 'craft brewery'-only jobs and taxes. But the Brewers Association notes that, nationwide, 'craft' breweries currently employ an estimated 108,440 full-time and part-time workers, who, in 2012, produced approximately $10.2 billion worth of beer. Since 1969, the state of Virginia's iconic slogan has been "Virginia is for lovers." In 2012, at the Great American Beer Festival —the premier competition for 'craft' breweries nationwide— Virginia breweries garnered the 5th most medals of any state's delegation. Might one say now: "Virginia is for craft beer lovers"? The sales staff and management of northern Virginia wine/beer wholesaler Select Wines, Inc. traveled north to Halethorpe, Maryland (just south of Baltimore City), on 30 July 2013, to visit the production facilities of Heavy Seas Brewing. recent installation of four new tanks, including three 200-barrel tanks. recent installation of a new keg filler, and a new cask washer. a centrifuge to replace the current DE filter, for beer clarification. a new multi-roller mill, for increased yield efficiency. a new KHS packaging line, capable of filling 16,500 bottles per hour, nearly doubling the current rate. expanded lab facilities, including state-of-the-art analytical devices. a much larger cold room for refrigerated storage of packaged case, kegs, and casks (at 54 °F). increase in barrel-aging program, including rum barrels for a new winter beer. a threefold expansion of the plant itself, including a new hospitality room and outside beer garden. a new 100-barrel brewhouse, twice the size of the current kettle kit, to be installed in 2014. Sisson noted that Heavy Seas distributes its beer in 18 states, along the east coast, and a few in the mid-west. That number has remained constant for a few years, as the brewery has concentrated on increasing availability within that sales "footprint." At the same time, production has increased. Sisson revealed that Heavy Seas brewed more than 32,000 barrels of beer in 2012, a three-fold growth over 2008, four years earlier, when the brewery's output had been about 13,000 barrels. He expects production to approach 50,000 barrels this year, and greater yet within a couple of years. Not that the fastest growing category of beer needs a boost, but today is International IPA Day, or as it's being promoted, social-media-style, #IPADay. At the 2012 Great American Beer Festival, the most entered style category was the American-Style India Pale Ale with 203 entries. The second most entered category was its close cousin, the Imperial India Pale Ale (128 entries). So, what's in your glass? Today, make it an IPA!